Love Pacific Coast! Looks like a great book. Would love to make one with arrows! I also love the pacific crest quilt on the cover. He will be teaching that quilt at my local quilt shop in the fall and I am thinking about signing up! I'm really loving the Cayucos quilt. I'm so glad someone has made quilts without the white background. Beautiful quilts. 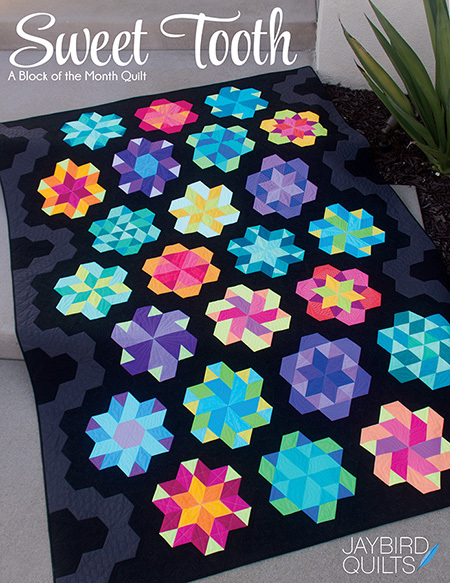 The Pinnacles quilt intrigues me and I would love to try it. I love Cayucos quilt! The colors are so beautiful. I would love to make this one. 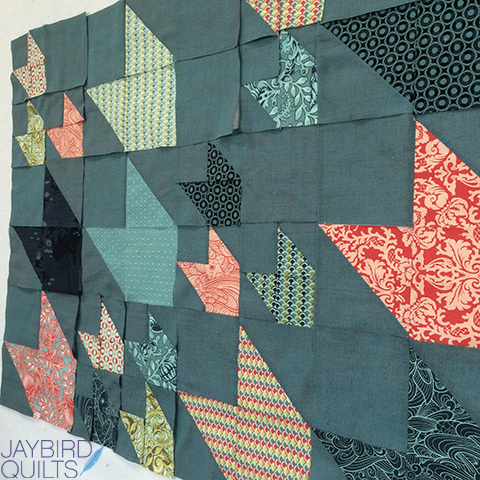 I also love Pacific Crest - I love quilts that contain the same block in multiple sizes. They all are great, but I agree with you about the "flow" of Pacific Crest. It's a great quilt & design! Cayucos really speaks to me! Such lovely use of color-but they are all gorgeous! Pacific Crest..... seems the best! Pacific Crest is my favorite too. It's like an advanced version of John's Lap Of Luxe, which is a design I made as a gift for a friend. Pacific crest is my favorite. And you are right, he does a great job of using colors as his background and neutrals. I really like the Glimmerglass quilt and the cover quilt. Glimmerglass is calling to me! I got some new fans at the Chattanooga WAS show that would look awesome! Hope I win the book! I love, love, love Pacific Crest! That dark background just makes the quilt sing! I agree with you. I love the quilt on the cover! I think that would be really fun to make! I love this book! I would love to make two of the quilts included--Cayucos and Pinnacles. I love the quilt on the cover. It's vibrant! Canucks - hands down my favorite! Great giveaway! I really like your version of the cover quilt. You surely embraced the "beyond neutral" with the background color. I love those shott cottons. I could probably use them in everything I make. I love the Cayucos quilt! Something about that turquoise background that just appeals to me! I'm with you: Pacific Crest is my favorite! Pacific Crest is my fave, but I like the movement in Glimmerglass a lot. That's the mark of a good book, when you can't pick just one quilt to make! I don't know the name of the quilt(s) but on the Martingale web site my favorites are # 2 and # 5. Love both of them. I love Cayucos quilt! Love the colors! Like you, I am taken with Pacific Crest. Thanks for explaining the book's title! Haha, I really didn't get! Oh I really like Pinnacle. This book looks great! I love the Pinnacles quilt. Would be perfect for my husband who loves to climb mountains. I like Pacific Crest. Would love to win a copy of the book, thanks for the chance! Love the cover quilt--I wish I had Neptune scraps to make it from! I am intrigued by Cayucos. The straight blocks and then the dip down is wonderful. Oh Glimmerglass is beautiful, I think it would be perfect with my colours on my bed. P.S. I love your quilting style Julie. I happened upon you on YouTube and had to check out your site. I'm looking forward to new posts and what your quilting future will create. I like Cayucos - the colors and the quilting are captivating! Pacific quest is awesome and so eye catching on the cover, but there are more to do rhan just that! Would love this book, thanks for the opportunity to win this fabulous book! Pacific Crest is my favorite, super job on yours too! Like the one on the cover. Thanks for sharing. 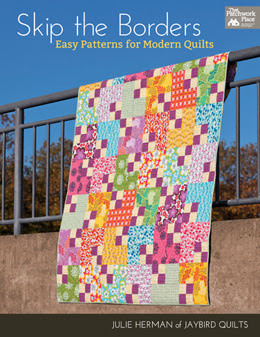 I love, love the Pacific Crest quilt on the cover, although all the projects are beautiful! I honestly can't choose!! I adore so many of them! Thanks for the chance to win! I would love to try Cayucos from this fantastic looking book. Thanks for the chance to win the book. I would do Pacific Crest! Love it! Pacific Coast is lovely... and thanks for the opportunity! There are several that caught my eye in your post. I really like John's background choices. The first I would make would be Cayucos. Pinnacles. I love the simplicity and the quilting is georgeous. G Fahrion at comcast dot net. You always have awesome books and patterns! I must say I love the Katami quilt ( I sure do hope I spelt that right). I think I would try the Cayucos quilt. I do enjoy seeing these quilts with non-white backgrounds. Thanks! Ooh, I think Pinnacles, as it reminds me of a fab national park in Oz. Thanks for the chance to win! Pacific Crest just knocks my socks off! 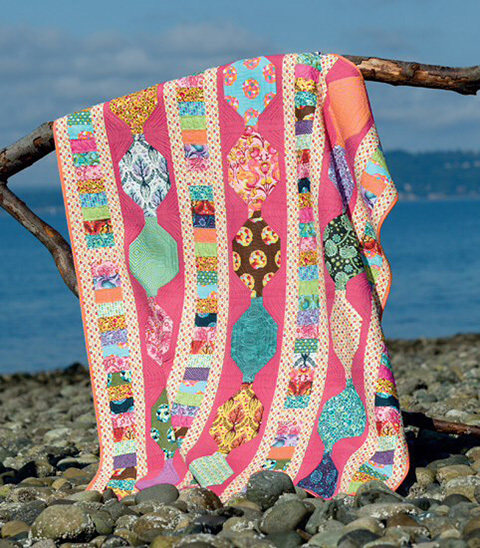 I think the Pacific Crest quilt is so pretty and would love to make one. Love your blog and thanks for the opportunity to participate in the give away! I'm like you. That quilt on the cover is amazing and pulled me in immediately. It's just wonderful. And I love your version!! I love the cover quilt too....it's my fave! So many fantastic quilts to choose from! I really love the cover quilt and Cayucos. Great designs! I really love Pinnacles and can see myself making that quilt! :) Thank you for the opportunity to win the book. I would make Pacific Crest. I like the way it looks. I love the use of colored background fabrics. 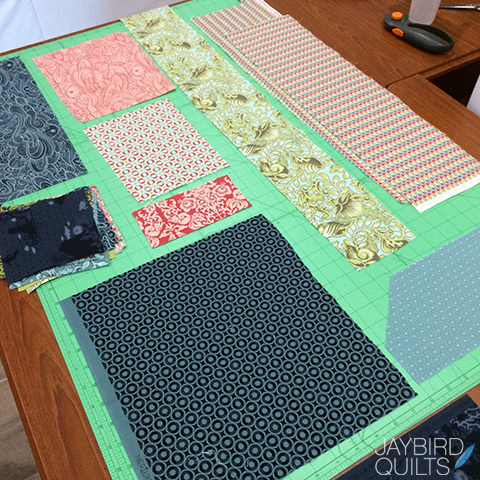 Canyucos quilt or pinnacles quilt would be the choice to make as to which to make. Very interesting designs. I'm dying to make pacific crest. It's my favorite. Hey Julie: that's very cool that John gave you a shout out. Quilters play so nice together. Cayugos quilt speaks to me. Then again, it may be the gorgeous aqua background that attracts me! Cayucos quilt is my favorite. Thanks! Julie, I agree that's difficult not to love all the quilts. I had trouble settling on a favorite quilt. After much consternation, I finally came to the conclusion that at this moment, Cayucos quilt is my favorite. Of course, if you asked me at another time, I might have a different answer. 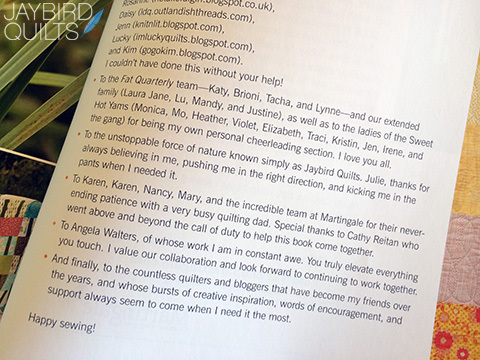 Thank you for participating in this book hop and sharing your marvelous quilt. Thanks for sharing the giveaway, too. Looks like a great book. I would really enjoy trying to do the Pacific Crest Quilt in a different color way to see how it would look. And I couldn't agree more about expanding our background color schemes into more than white, beige, and gray! I love the glimmer glass quilt. Have put it on my 'to do' list! Thank you for the giveaway. May I ask, does my comment give you my email address? This is the only way I have figured out to comment to a blog. I've tried looking it up to see if it gives you my email, but I don't know for sure. Your comment about being able to reach us worries me. I really hope you'll help me out and forgive my ignorance. Are you able to respond to me through email? Oh dear, I just realized by asking this, i am invalidating my entry into the drawing which is a shame because this book looks great, but honestly I need some inkling here if I am doing this right. I love glimmerglass, real pops of colour. I love them all, but I think I would like to make Pacific Crest first. I love John's book!! Cant wait to get my hands on a copy!! I love not using white for a background!! So much more interest!! 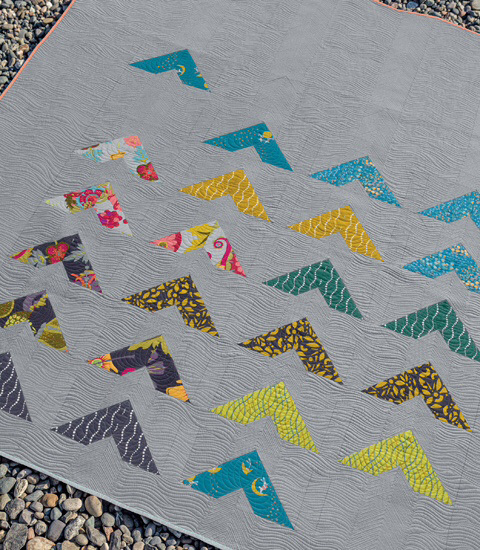 I love the Glimmerglass quilt. I am always looking for ways to use a background different than white! LOVE that one! Thanks for the chance to win. Love Pacific Crest, and also the quilting on Pinnacles. I think Cayucos although I love Pacific Crest too. I saw your post on instagram and loved the pattern!!! then when i saw the book I am sure I will try all of them!!! 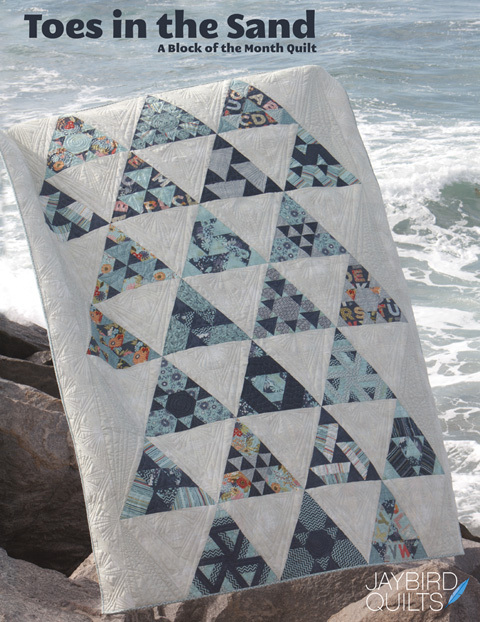 I am intrigued by the triangles (and possible variations in direction) of the Cayucos quilt. But I really like your Neptune scraps...may have to increase the stash. Pacific Crest is my favorite! I'd like to try sewing the Pinnacles quilt, but using Kaffe Fassett's lavendar shot cotton as the background. Love what I see of this book!! Am not sure I can choose only 1 to make from this book--every quilt I have seen, I want to make! I would start with Cayucos and make my way thru each & every pattern. 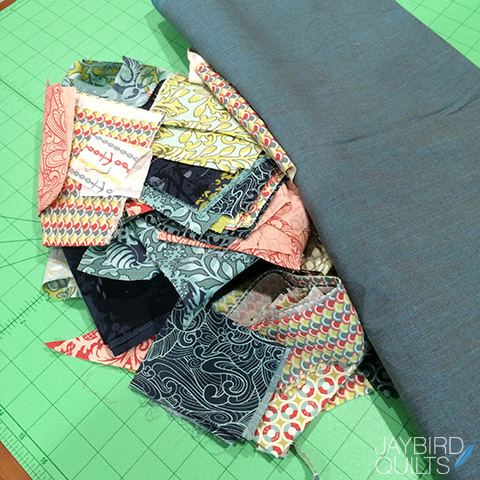 Love the Fabrics you put together for the cover quilt! I really like the Fire Island quilt and the cover quilt. I do believe it would have to be Pacific Crest - it reminds me of a flock of birds flying over me! That Pacific Coast must be made!! Glimmerglass, I love it in that color, and really like the form of those stripes. I really liked Cayucos, simple but really pops with the teal background. Being a hiker and originally from the Pacific Northwest the name Pacific Crest caught my attention. And it's a great quilt for the left overs I've been collecting. 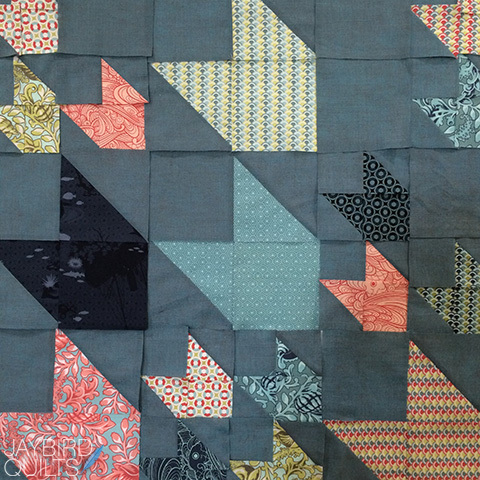 The Pinnacles quilt is my favorite. 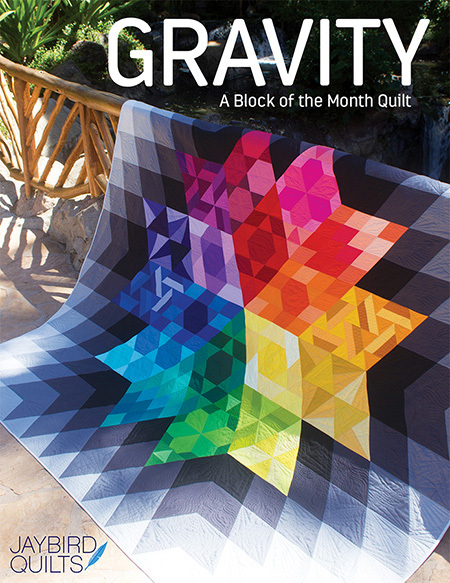 As much as it seems like I'm jumping on the bandwagon here, that cover quilt is awesome. Then again, once I have the actual book in my hands and fawn over it for a while, I could change my mind! :) Thanks for the opportunity to win! Would love to make the Cayucos quilt! Okay if I have to name just one, I'll choose Pacific Crest. But your post and photos of the quilts in the book gave me some other ideas too: Cayucos looks intersting; ;ove the use of pink as a background color; and I've bee dying to use some of the shot cottons with prints but needed to see how it would look. I would sew Pacific Coast first. Looks like a great book. 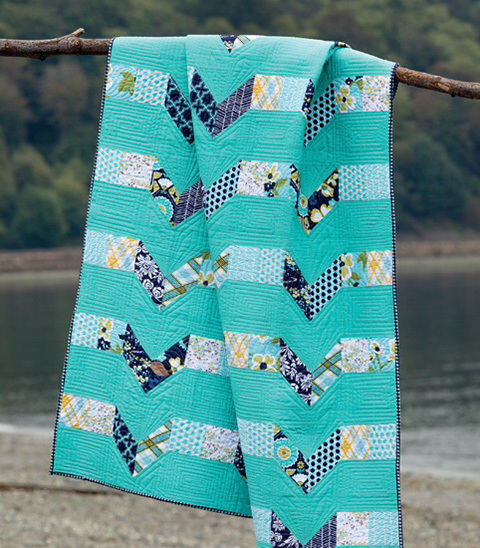 Pacific Crest is the quilt that speaks to me. Thanks for the chance to win! "Glimmerglass" struck my eye---I even have some of the parts needed! I'm torn between Katmai and Cayucos. Definitely looks like a book worth buying! I love Cayucos - I love zig zags and arrow head motifs. Think Triton Cove, Pacific Crest and Pinnacles are fantastic too! Triton Cove calls out to me! I can't decide between the Katmai or Cayucos quilts. All of them are just beautiful. I really like the one on the cover! I think my favourite is the Cayucos quilt. There is just something special going on with the clear colours and relatively simple design. I like Glimmerglass and Pacific Crest quilts. I may make consider the Pacific Crest quilt for one of my nephews. I would make Cayucos for my niece's wedding present. She loves aqua, and I would use black and white prints. Thanks for the opportunity to win a great book! Pacific Crest!...but really they all look terrific...I like your version too, and it's always nice to see more than one version of a pattern to get your mind going. I wold love this book! I love Pacific Crest and Glimmerglass also! Love the rulers I have purchased due to there versatility. Love this book! Katmai is my favourite. Can't wait to do this one! Pacific Crest, love the flow!! I'm a beginner quilter, but I'd love to make the Cayucos quilt. It is just my style! I love the cover quilt too! If I get my hands on that book, I will be making it! I think Pinnacles would be fun to make. thanks for a chance at a great book. 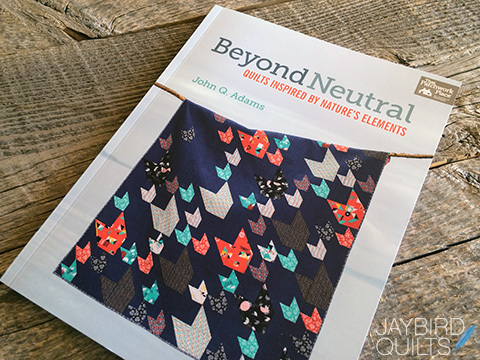 Beyond Neutral has several quilts I'd like to make. The Pacific Crest quilt on the cover of the book is high on that list... as is the Cayucos quilt!!! I would be sooo happy to win a copy of this marvelous book! Thanks for the opportunity. I like Triton Cove.....I have some Cotton and Steel fabric that I think would look great for that pattern. 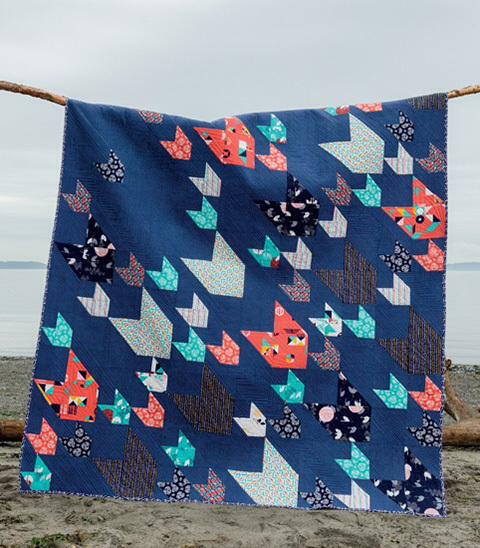 I love all of the quilts, but the Katmai caught my eye immediately. It is soothing and I see it being Asian inspired. Of the quilts I could see, really like Cayucos. Love the chevron-ish idea but not quite chevrons. Looks like a great book. Thanks for sharing and for the give away. I love Cayucos. Thanks so much for the chance to win. I try hard to keep quilts in a mod neutral but I always add to much color.. so maybe a few patterns that this book has will help out. I would love to try the Triton Cove quilt. I know exactly which fabrics I would use from my stash too. Cayucos, as I spent many summers there and love that part of California. I'd use the watery blues and greens of sea glass, with a dash of "sandy" colors too! Love the Cayucos and the Triton! I have been eyeing this book for a while now and I am sure I must have it. My first quilt from it would be Cayucos. Thank you for the review and for offering a giveaway. I like Triton Cove. I agree that Tula Pink fabrics would be a good match for his quilts. Looking forward to winning his book. Glimmerglass! wow love the colored background! Your quilting ideas really inspire! I too love Pacific Crest. It looks like the quilt will just FLY off the wall! 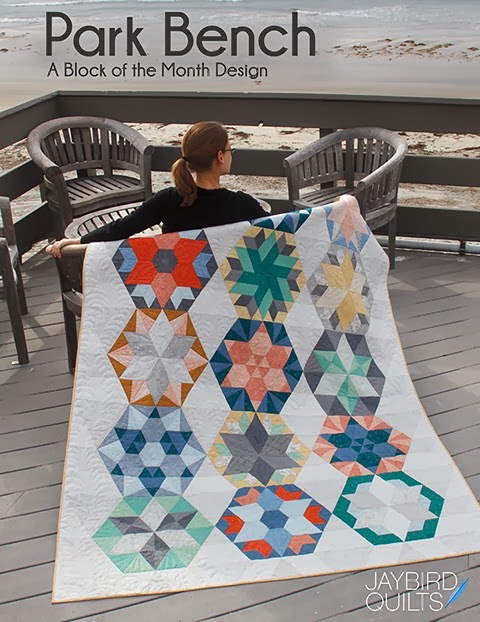 I like Cayucos quilt and I think I would use the new line coming out from Maureen Cracknell. This does look like a great book! I want to make Glimmerglass, one for name and two what a great way to use a variety of fabrics. Gorgeous book! Triton Cove for me--I can already see the quilt. I am with you... Triton Cove is what I would make first and love how you pressed all your scraps, that inspires me to get my scrap basket out, which is overflowing, and do the same! Press up some pieces and see what I have that will play nicely together. I love the Cayucos quilt with those lovely colors!! Looks like a great book! Thanks Julie for telling us about it. Glimmerglass looks wonderful, although I don't think I would do it in pink! I like many but choose Cayucos for my pick. I've seen the book at the library and it is lovely! Love the Pinnacle quilt. I'll be looking for this book in my local shop. I love the Cayucos quilt. Thanks. Glimmerglass. I would use some of my purple scraps for this one. 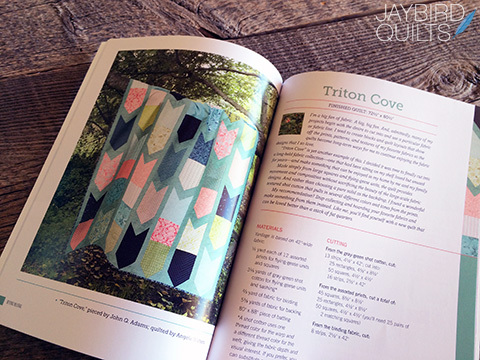 Love to see all the eye candy quilts in John's book! Cayucos caught my eye but I'm also loving Katmai. So neat with the low volume fabrics in that quilt, so lovely! Thank you and John for a super giveaway and a chance to win. I love all the quilts. The cover one is my favorite. 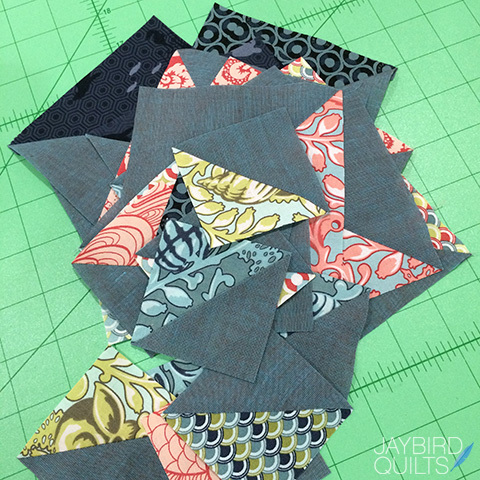 I love the Pacific Crest and am intrigued by how you changed it using your Tula Pink scraps. I am so drawn to Pacific Crest which is so beautiful. I think I would like to try the Pinnacles quilt. It would challenge my fabric and quilting choices. Pacific Crest, since I live near PCT (Pacific Crest Trail). Also love the quilt design and that it's by a man. I'm totally with you on the Triton quilt I LOVE it! Looks like even me a mere beginner can try my hand at. Love to make Cayucos, although all are a consideration. I am inspired to make the cover quilt, Pacific Crest. I was drawn in by the cover quilt, Pacific Coast but I also like Pinnacles. Your version is looking good! I just love Cayucos! Great looking book! Truly inspiring, makes me want to run to my machine and start sewing! I really like the simplicity of Cayucos and the aqua used as the background. I may try making some blocks from the Pinnacle quilt to add to a Halloween quilt being made as a wedding gift. Thanks for the opportunity to win the quilt. 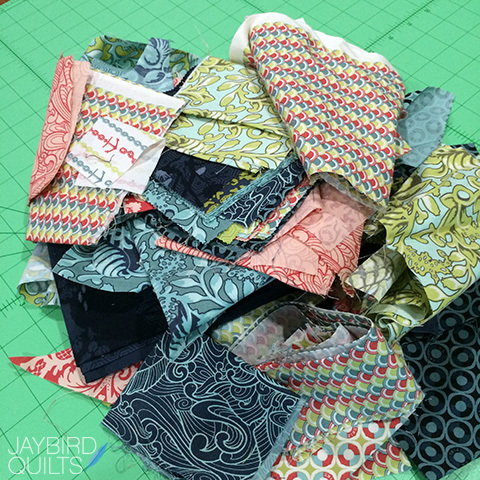 The Glimmerglass quilt has such pretty colors - makes a person think of sunrise over the ocean, and bright balls floating on the water like Japanese fishing floats. I would make the Pinnacles pattern first. Thanks for the chance to win! 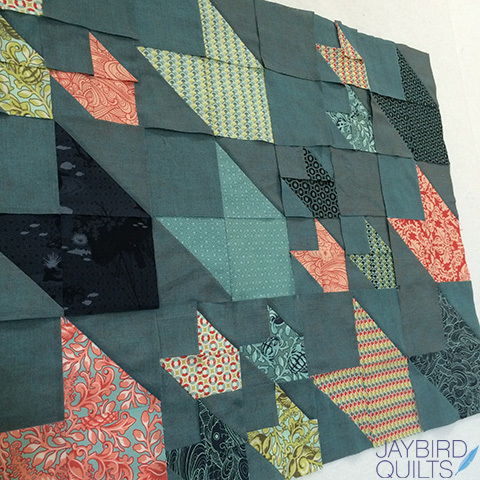 I like Cayucos, but it may be because of the colors used in the sample quilt. And I also like the movement of Glimmerglass. So it would be a toss-up between those two. I like the Triton quilt. It looks like it would be fun to make as well. I love Pacific Crest. Love the rest of the quilts in our blog. I too love Pacific Crest, but there are lots of great options! I was taken when I saw this book at Schoolhouse. I've always loved colored backgrounds and not realized what I was missing in quilts when we've gone to so much white and neutral. Love the designs and everything. Thanks. I love how John looks at the world around him for inspiration! 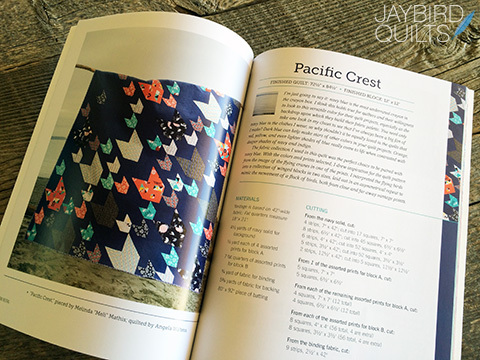 I immediately fell in love with Pacific Crest when I saw the book in a quilt shop, but when I opened it--I fell in love with almost every quilt. And I could imagine making one of the quilts in the colors of the Maine coast where I live! I like both Pacific Quest and Glimmer Glass for starters. Ooooo! 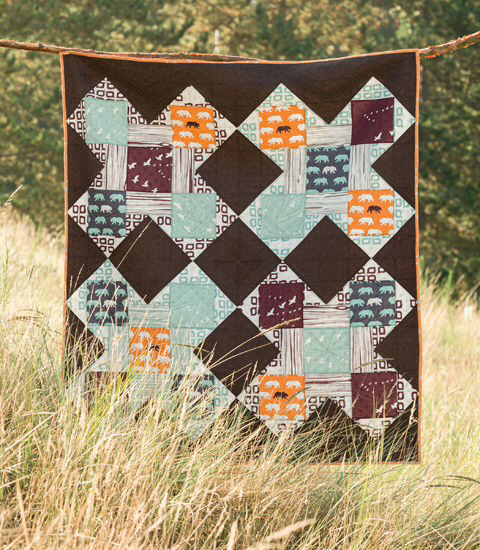 I LOVE the Katmai quilt! 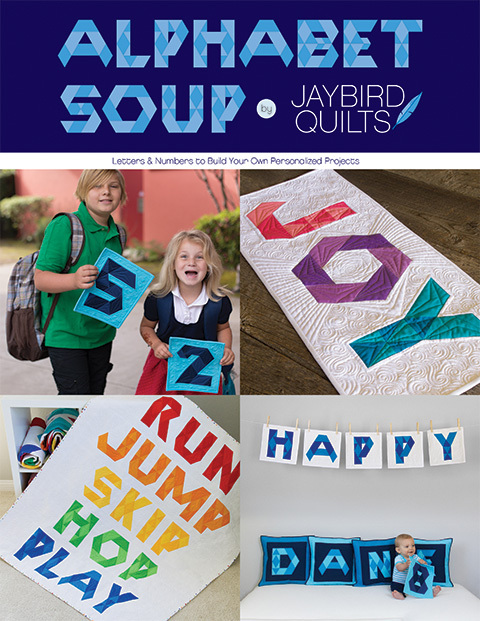 I would love to make that Cayucos quilt! The colours are amazing! I like the Pacific Crest best I think. They are all worthy of a second look, but I like the synergy in this one best of all. Would love to win this book. Thank you for the opportunity. I love the Cayucos. Quilt. I in fact liked all the quilts pictured in your blog. I would like to make Triton, and I have just the perfect selection of fabrics for it. I would love to make the Cape Lookout quilt. I really like the color gradation.